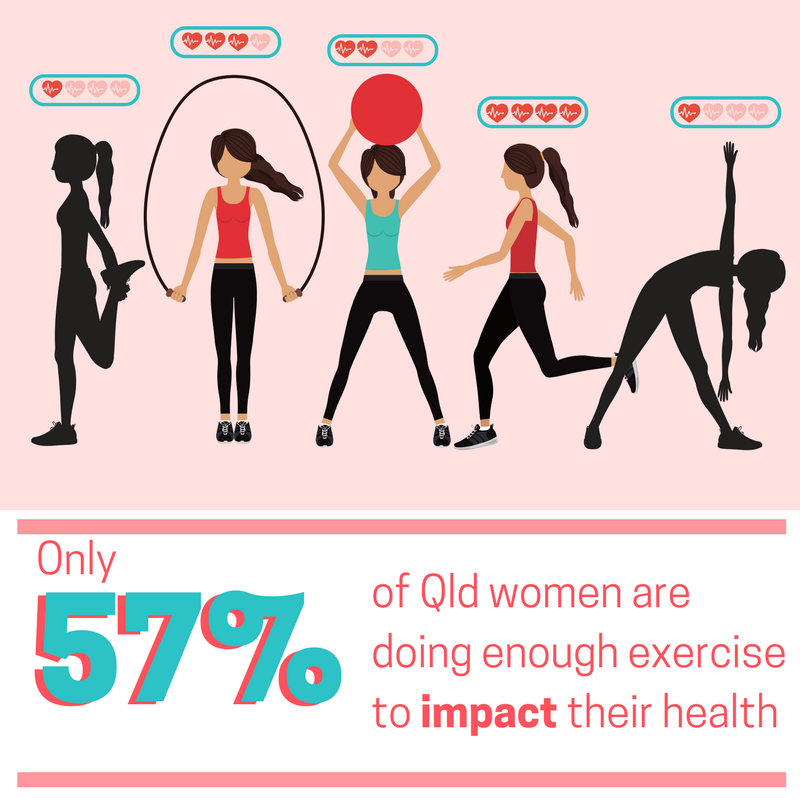 Only 57 percent of women in Queensland are doing enough activity to make a difference to their health, increasing their risk of heart disease and stroke. Queensland Health Preventative Health Executive Director Kaye Pulsford said the majority of Queensland women were sufficiently physically active, but only half of the population were meeting the recommended guidelines to combat chronic disease. “Physical inactivity accounts for 30 per cent of the coronary heart disease burden among Queensland women,” Ms Pulsford said. “Some risk factors cannot be controlled, such as a woman’s age, ethnic background or family history – but there are many risks that can be reduced with positive lifestyle changes. “We know that physical inactivity is one of the most common modifiable risk factors affecting women and while the majority of Queenslanders are getting some exercise, they are not getting enough. “It is recommended that adults accumulate 150 to 300 minutes of moderate intensity physical activity each week, which means if you are active on most days of the week, you only need to do half an hour each day to meet the recommendations. “Women should also be doing muscle strengthening activities at least twice a week, such as body weight exercises or resistance training. Brisbane resident, Deb Mahoney-Dobbs was 43 years old when she found out she had coronary artery disease. “I knew there was a significant family history of heart disease – my father had his first heart attack when he was 32 years old and had a total of eight heart attacks in his lifetime,” Ms Mahoney-Dobbs said. “I had an angiogram done on my heart and it showed that I had 50 to 60 percent blockages in my arteries, so I’m now on medication and have taken up regular walking to keep my heart as healthy as possible. “I count my steps and I make an effort to make sure physical activity is part of my day, even with working full-time. I grab the opportunities to walk regularly and also like to swim when I can. Queensland Health supports a number of programs to help women get active and make healthy lifestyle choices, including Heart Foundation Walking. Heart Foundation Queensland Health Director Rachelle Foreman said that regular physical activity was a ‘wonder drug’ with many physical and psychosocial benefits and few side effects. “We know that women are leading incredibly busy lives and many spend a lot of their day sitting down, either at work or in a car,” Ms Foreman said. “But it is really important to look after yourself too and fit physical activity into your daily routine,” she said. “Small changes, like using public transport or walking up the stairs instead of taking the lift, can make a difference to your overall health and reduce your risk of heart disease.